St. Patrick has been enshrined in myth and history as a benign and beloved figure, a native Irish miracle worker who drove out both the snakes and the Druids and gently issued in the age of Christianity. Nothing could be further from the truth. Magonus Succatus Patricius was of Roman heritage; captured into slavery in Ireland at the age of sixteen, he escaped at the age of twenty-two. Now, the forty-year-old “Padraig” returns to the site of his shame. Full of anger, he is determined to bring Christianity to Ireland, even if he has to beat it into the Irish. But then something happens to change Paidrig . . . something shrouded in mystery and wonder. I’ve always been fascinated by Ireland, its traditions, culture and lore so I was delighted to receive this book as a present for Christmas. In it, Irish legends are intertwined with the story of Saint Patrick, creating a tale that, albeit not very historically accurate, is nevertheless highly enjoyable. And to make the book flow easier and allow the reader a more comprehensive read, at the beginning of the book you can find a list of the characters and places explaining who and what they are, together with their correct pronunciation! Magonus Succatus Patricius, a Roman Citizen and a Christian priest, goes back to Ireland, the land where he was brought after he was kidnapped to be sold as a slave, to convert its inhabitants. Although he has resigned to do the will of God, he is determined not to like neither the country nor its people: he considers them inferior, uncivilized and refuses to acknowledge even his Irish name, Padraig (pronounced Par ig). But to be successful in his mission, Patrick needs to understand the Hibernians and their traditions, and to speak their language. To help him achieve this, God sends him the poet Ossian (O Sheen). The son of the great Finian leader Fionn Mac Cumhail (fin mac cool), Ossian represents the old Eire, with its traditions, legends and druids, that is being swept away by the coming of Christianity. The stories Ossian tells about his father and the Fianna warriors, which is a story within the story, are also relevant to the situations and struggles Patrick is facing and guide him, helping him decide the right thing to do. But it’s not just his prejudices that Patrick will have to fight to accomplish its mission, he also needs to come to terms with his feelings for the female druid Ainfean (an f’ an). The two fall in love but Patrick has taken a vow of celibacy and he is determined to keep it. The book also ends with a twist that I won’t be revealing here, obviously. But it is a fitting end for a book that flows smoothly and enchants the reader mixing history and legends. If you’re interested in Irish lore or on the story of Saint Patrick and how he converted the Hibernians (although we don’t know much about this so most of it is made up by the author) I really recommend this book. 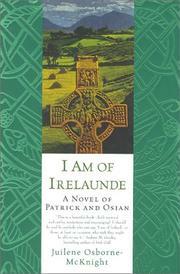 I highly recommend I Am Of Irelaunde by Juilene Osborne-McKnight to anyone interested in Irish culture and the story of Saint Patrick. The figure of S.Patrick that emerges from this book is different from his Christian portrait we all know. A stubborn and prejudiced man, something will happen that will make him grow, evolve and start to understand Ireland and its people. Although it’s not very historically accurate (but then we don’t really know that much about S.Patrick), it’s a light and enjoyable tale.